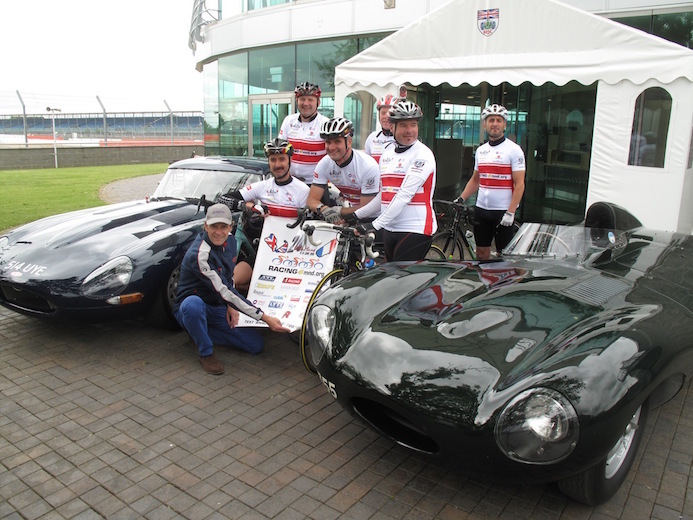 Team at the BRDC, surrounded by beautiful Jaguars that Neil Cunningham raced. 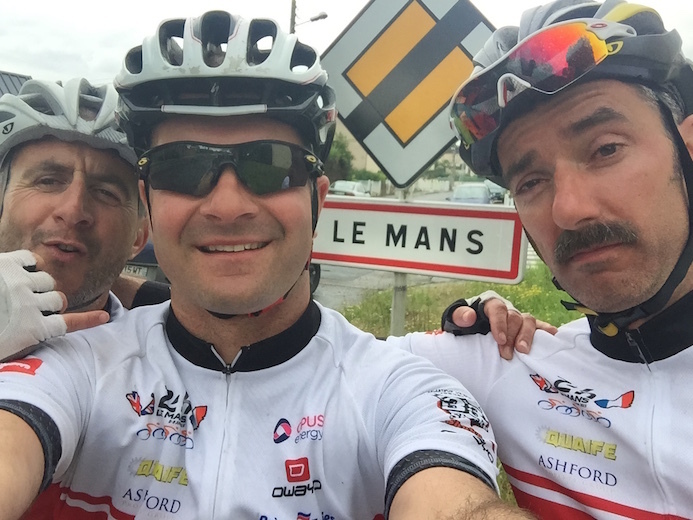 Ragus Pure Sugar Energy helped power a team of 6 cyclists on an epic 24 hour endurance ride covering 220 miles across the continent from Silverstone race circuit in Northamptonshire to the world famous Le Mans 24 hour race in France which takes place this weekend. This continues Ragus’ support of raising awareness for Motor Neurone Disease (MND) to enable further advancement in the research of this horrific disease. 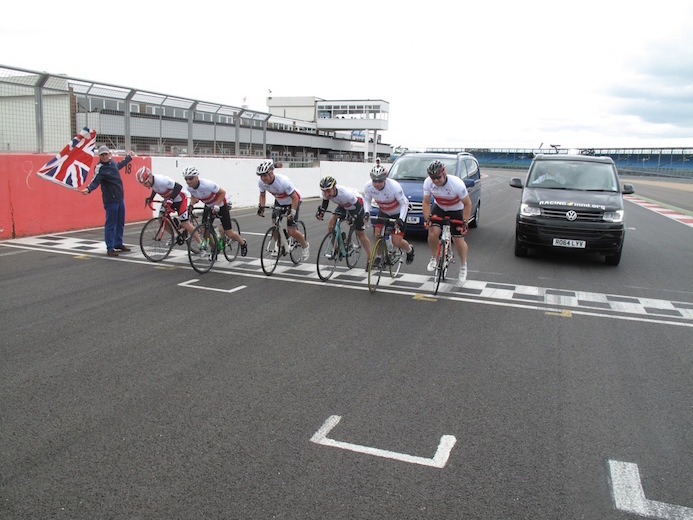 Ben Eastick waves the Union flag to start the challenge with a lap of the Silverstone Circuit. Over the last three years, Ragus has supported various fundraising events in aid of Neil Cunningham who has been bravely battling MND over the last five years. From New Zealand originally, Neil was a successful athlete as a surfer in his home town of Swansea and a professional racing driver for twenty seven years, who competed at numerous Le Mans 24 hrs. Latterly Neil found fame as one of Top Gear’s Stigs and a stunt driver on the Top Gear Live show, as well as featuring in the James Bond film, Quantum of Solace. Adam Bere organiser of the event at Le Mans within the 24hrs. No. 18 Porsche on pole position for Le Mans 2015. Motor Neurone Disease affects both young and old alike, but particularly occurs in young fit and healthy people. Recent advances in research has given hope that a cure for this lesser known disease is imminent. Ben Eastick and the team. 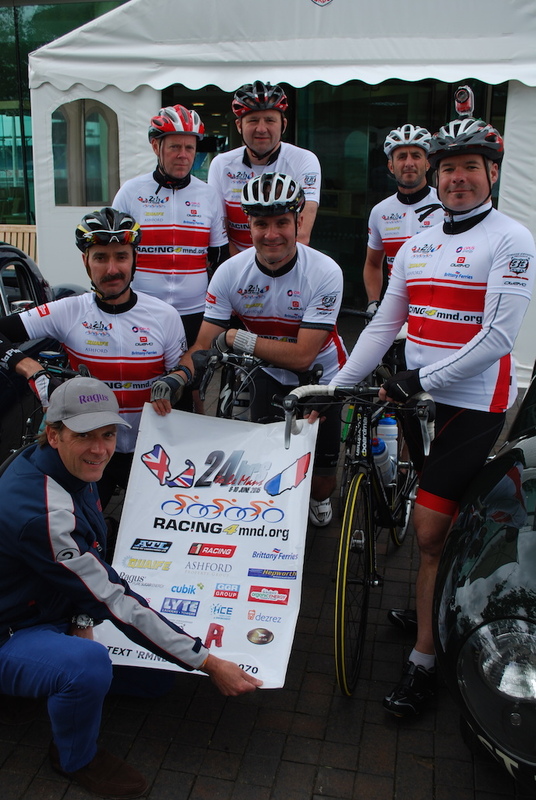 The target for the 24hrs Le Mans cycle ride is to raise £25,000 of which over 51% has been raised so far. This money together with over £100,000 raised in the last 3 years will be multiplied by a factor of three from corporate funding. 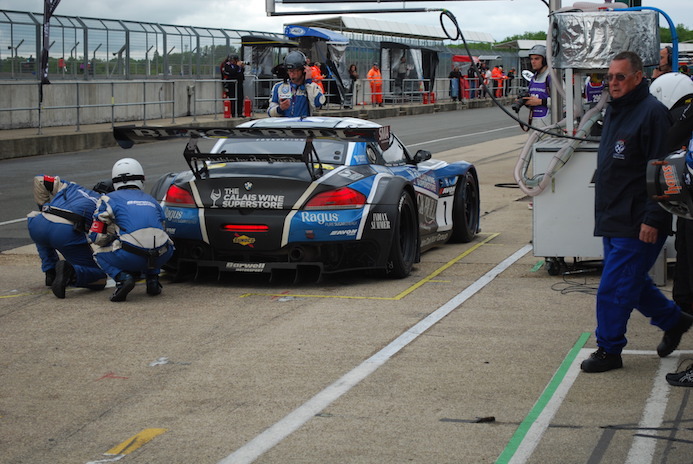 Ragus BMW Z4 GT3 serving a 20 sec ‘success’ penalty. Ecurie Ecosse powered by Ragus Pure Sugar Energy saw drivers Marco Attard and Alexander Sims extend their Avon Tyres British GT Championship lead after finishing 3rd in the series’ blue riband three hour Silverstone 500 race on Sunday afternoon. It was the legendary Scottish squad’s third consecutive podium finish of the campaign after winning last time out at Rockingham and coming home 3rd at Oulton Park. 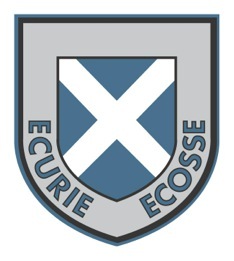 After qualifying 3rd in the dry on Saturday, the start of Sunday’s initially sodden race saw Barwell’s team-mate Jon Minshaw enjoy a fierce battle with Attard before a safety car period after half an hour prompted Ecurie Ecosse, along with most of its rivals to pit early and install Alexander Sims. So long was the safety car out, the BMW factory driver was called back in to the pits after just a handful of laps to switch to dry slick tyres and to put Marco Attard back aboard for his second driving stint. 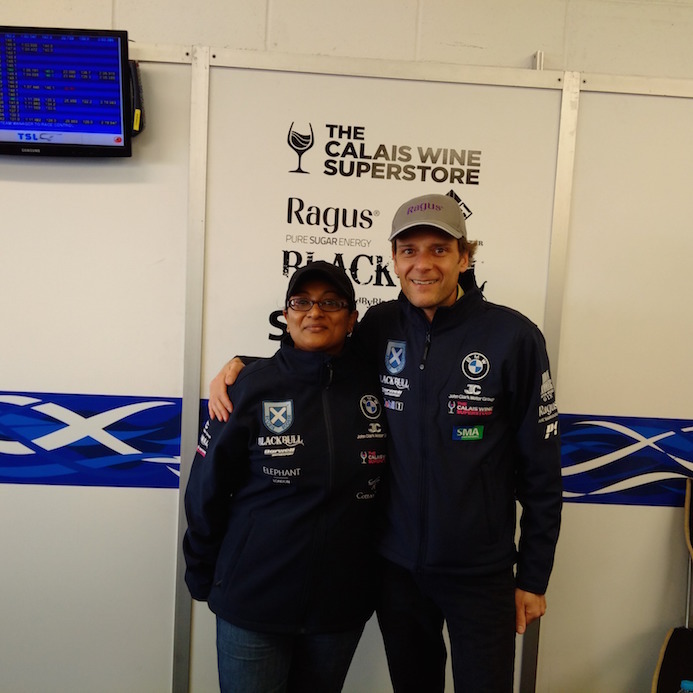 Ragus’ Theresa Pereira with Ben Eastick in the pit garage. With teams choosing different tactics the race’s definitive picture did not emerge until Sims climbed behind the wheel for the final time with an hour of the race remaining, and subsequently reeled off the race’s three fastest laps, which helped Sims close in and take 5th place before the afternoon’s second safety car period, caused by the leader crashing his Aston Martin. Once racing resumed Sims carried out an audacious sweep around the outside of Daniel Lloyd’s Aston Martin at Stowe and along the Vale. There was little time to make further progress thereafter and Sims ultimately finished just 7.1 seconds behind the race winning McLaren, and 2nd place BMW Z4, despite having to serve a 20 second ‘success’ penalty for winning at Rockingham. A delighted Ragus team of Ben Eastick, Frank O’Kelly and Theresa Pereira were there to witness the action as it unfolded. 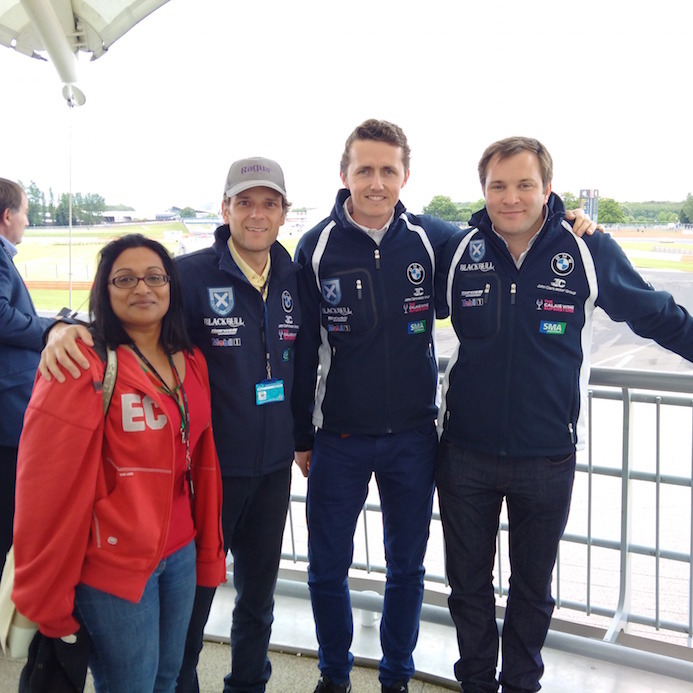 Theresa & Ben with Blancpain drivers Oliver Bryant & Alasdair McCaig view the action from the BRDC. 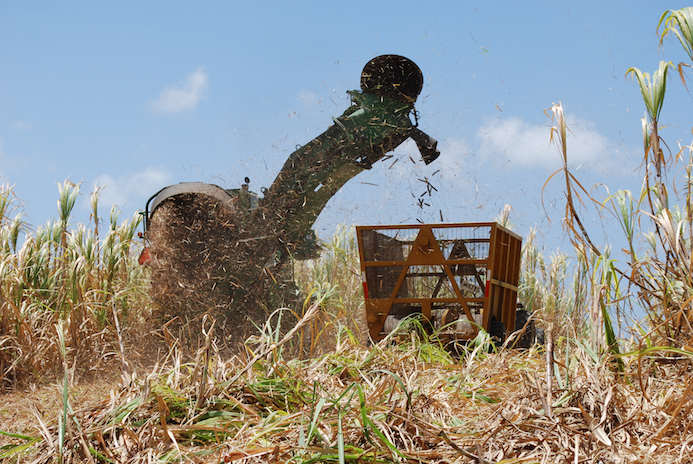 You are currently browsing the Ragus blog archives for June, 2015.